creating work | Here You Begin . . . I was blessed with these departing words — ‘As courage,’ as in the verb avoir in the tu form in French, have, and means in this case ‘take or have courage’ — a little under a decade ago by a lovely older woman, a much beloved mom of my friend. She knew a bit about what she bid me to take as we departed company that day — “Have courage” — as she’d done work with the French Resistance as a teen in her native France and she’d raised two girls on her own as a mother who’d been left by a husband and father when her children were very young. She knew what it was to have courage, to take courage, and she said this to me as I was facing the beginning of some challenging times in my own life-time here. I took the words to heart; the encouragement brought to mind a model of grace and fortitude I would attempt as I faced the coming storms buffeting my own home and family at the time. And I knew the phrase to mean both to “take heart” and “to have courage”, especially when used as a phrase when departing, as she intended. What else are we to do but “to tell all one’s heart” when creating our Work, when being people who live our work and work our lives On Task and On Purpose? I’ve anguished often over how smarmy my book is. 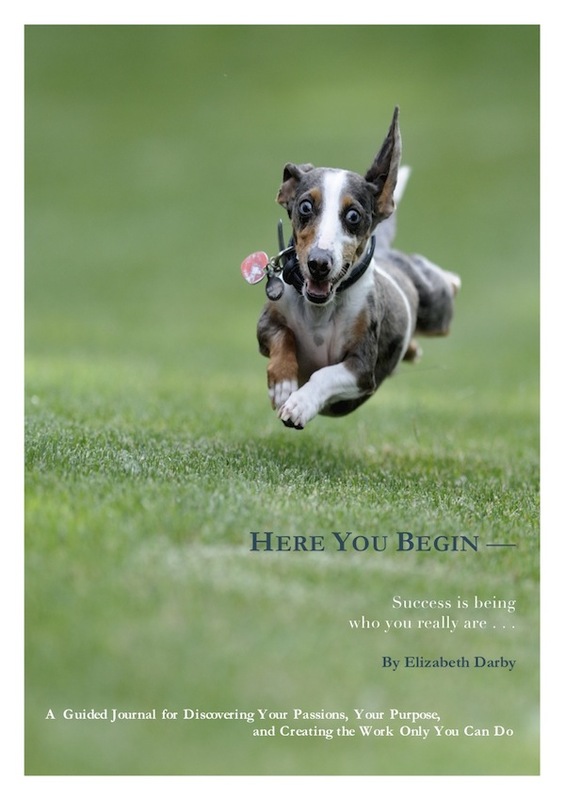 As a journalist who was trained to ‘tell the story like it was’ in national media and to do that required a good cynicism (notice I didn’t say healthy) toward all aspects of the story I was covering, my offering a book that is encouraging you to be honestly who you are and to create the work ‘only you can do’ has often felt like I’ve donned an angel sweatshirt and grin absurdly. Indeed much of the response I received from others while writing it — the ones who were able to talk rather than choke on their snort and scoff as I told them about it— was that such an idea, that we each have work that only we can do, was preposterous. I noted silently that these early responses came from those who at best endured what they were doing with their life-time, but felt they couldn’t quit as they ‘needed the money.’ That most of these folks were well into the 7 figure salaries told me they were fearful and trapped; what if… was a dangerous question to them, even though “doing one’s Work here” doesn’t mean necessary impoverishment. So to see Ms. Brown’s amazing TED talk — even belatedly — brings tears to my eyes. Yes, do have the courage to tell all of your heart. Have courage to do that which combines your heart’s telling with your talents, your skills, your passion, your soul, in the service of that which you care about. Have the courage to be You, shining in this world, On Task and On Purpose. And if you don’t know what that is, have the courage to go on a journey of discovery. I woulld love it if I – and/or the little questions in my book — would give you a good start. Blessings on whatever you do with your day today; may it involve the telling of all of your heart in some way. PS there’s another little reflection on what it is to have courage at my other blog: Earth: Sacred/Possession, too.